12 weeks done, 705km run! Our ‘parkrun to the Paralympics’ challenge continues with Chris Payne from Derbyshire Ducks maintaining his 100% record – he’s managed a parkrun every week since the launch on Saturday 25th August so has individually contributed 60km. Not far behind are Goalball UK staff members Kathryn Fielding and Stephen Newey who have each completed 10 parkruns (= 50km). Kathryn has been doing parkruns for almost 10 years where as Stephen only started as a result of the challenge but has well and truly caught the parkrun bug! Hillsborough parkrun is his official ‘home’ where you’ll often also find South Yorkshire goalballers Louise Simpson and Anthony O’Keefe. Tom Britton, Jack Peters and Robin Faulkner from Croysutt Warriors have now become regulars at Lloyd parkrun. They even got up extra early on Saturday 20th October with the intention of doing some ‘parkrun tourism’ (with Kathryn) before the regional tournament in Cambridge. Unfortunately a flat tyre resulted in them not making it to the start line in time though. With 8735km (= 1747 parkruns) still to go, we need more help so if you’ve been thinking about getting involved but haven’t as yet, come on! There is also the option of Junior parkrun (which is 2km) on a Sunday morning for anyone aged between 4 and 14. If you would like any more information, including help finding your nearest parkrun (and/or help finding a guide runner), please contact Kathryn (Tel. 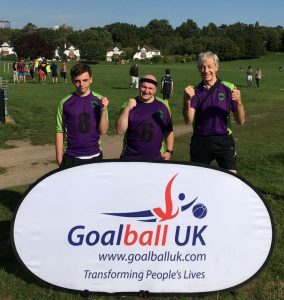 07795 263642 or email kathryn@goalballuk.com).